This Summer Holidays Key Pendant is fresh and fun! This Create Your Style Do-It-Yourself Guide shows you how easy it can be to make such a beautiful crystal keychain! This project is designed with the 4137 Fancy Stone in 33x24mm Crystal Silver shade, 2 8mm 5000 Round Beads in Air Blue Opal, and a 12mm 5810 Swarovski Pearl in Platinum. Decorate In Style this Holiday 2010 with these Beautiful Crystal Ornaments! In addition to this year’s Exclusive Limited Edition Swarovski Red Tip Holiday Ornament, Merchants Overseas is also carrying two new holiday ornaments from the Beadelle(R) Collection! It’s the Sparkly Trio! The 2010 Beadelle(R) Holiday Designer Ornaments will add a touch of sparkle and an affordable luxury to this Holiday Season! Each ornament features a Beadelle(R) tag to ensure authenticity, and is packaged in a classic window gift box. Both the Aurora and Stellar ornaments come with interchangeable ribbons offering you color options! 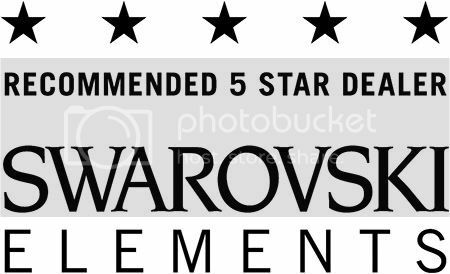 5% Off and Free Shipping on Swarovski Crystal Buttons! 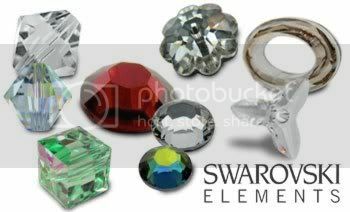 Swarovski Crystal Buttons can be used in innovative ways or exactly the same way as standard buttons. They are perfect for any garment including shirts, blouses, jackets, coats, denim and accessories. 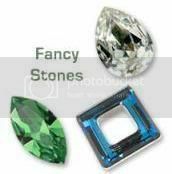 Suitable for both hand and mechanical application, they will add an extraordinary sparkle to your designs. Use Coupon Code BUTTONS at check out! 5% OFF 2 or more packages! Use Promo Code MO0801 at Checkout!! The 6554/4 Squirrel Pendant is a crystal replica of the cute furry land creature. This 3D pendant is a perfect example of the precision cutting used to make all of the SWAROVSKI ELEMENTS, featuring detailed faceting along its tail and an acorn for munching. Free Freight Alert! This Wednesday July 28th! Call a Sales Associate Today at 800-333-4144! We know shipping can get very expensive especially for our customers in the UK, Australia, Canada, etc. 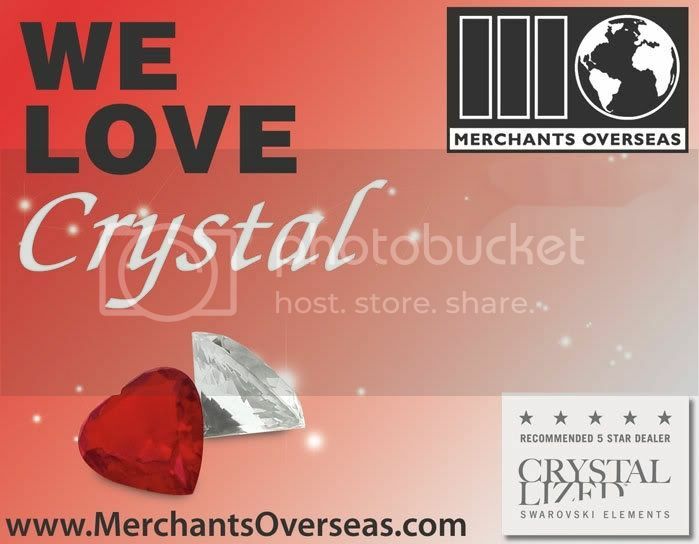 That’s why we’re offering FREE SHIIPPING on all orders of $200 or more on MerchantsOverseas.com! DON’T FORGET To Use Coupon Code FREESHIP at check out! The Create Your Style with SWAROVSKI ELEMENTS program came out with its newest Do-It-Yourself Instruction guides for summer. The first is this Summer Holiday Ocean Necklace inspired by the sea and its beautiful colors and creatures. This beautiful necklace is beaded with Swarovski 5000 round beads in Turquoise and Carribean Blue Opal. The staple item is the large 30x22mm Vitrail Medium 4127 fancy stone. As you make your way further down, the necklace features a 5328 bicone bead in fern green, 4437 fancy stones in bermuda blue, the 5727 fish bead in capri blue, 6690 pendant in Fuchsia, the 6721 star pendant in Indicolite, and the 6790 dolphin pendant in Amethyst. This necklace features an array of the most popular and amazing colors SWAROVSKI ELEMENTS has to offer! Click Here to view the rest of the Create Your Style Instruction Guides! Call Merchants Overseas Today at 800-333-4144 to Order the components to make this amazing necklace!